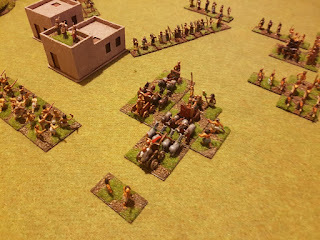 Had a game last week using the horde of Sumerian/Akkadian figures Andrew has accumulated. I love it when wargamers put in the effort to build complete forces for a period like this, able to supply both sides in good numbers. A pleasure to participate! 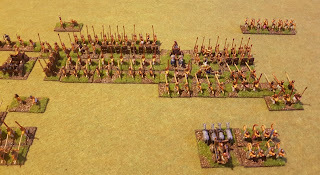 Sumerians are list number 1 in Ancient Wargame rulesets - the first civilisation at about 3000 BCE. Even further in time before Rome than we are after Rome. Sumer was a collection of sometimes competing and sometime co-operating city states. 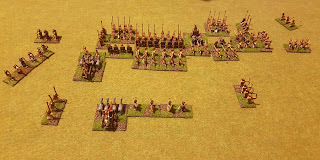 Their armies consisted of spearmen/pikemen, axemen, archers, slingers, stone throwers, and 2 and 4 Equid 4 wheel chariots. Equids were small donkey like animals, less powerful than a modern horse, hence why the chariots had 4 wheels. The Sumerian relief below shows them in action. For this battle we used Big Battle DBA. Andrew used the Early Sumerian list, and myself the later Akkadian one. Andrew's pike were classed as solid, mine as fast. So mine moved faster but didn't have as much staying power. I also had a greater number of pike, and also some rabble (hordes), while Andrew a greater number of archers (some Elamite allies), and some axemen. Here's the setup, with me as the attacker, and a little disappointed by the battlefield terrain my Akkadians have found themselves in! 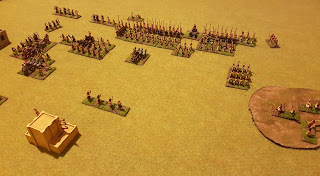 Given my Akkadians have the speedier foot, my plan was to try and attack the flanks of the Sumerian force. 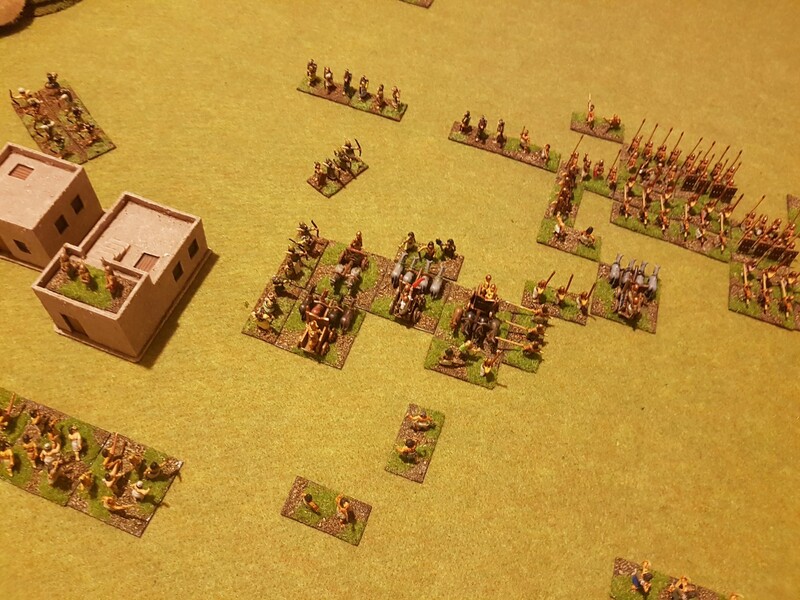 However, on my left flank is a built up area already occupied by the Sumerians which I wouldn't be able to take without a tough fight. 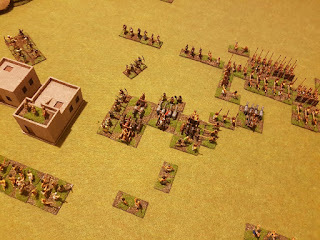 On my right flank is difficult ground that will slow an advance. On the left I'm outnumbered and facing many archers. 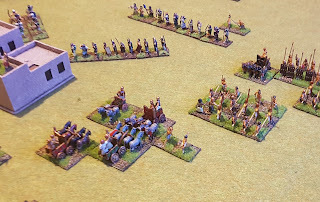 I throw forward some light troops, hoping to lure the enemy chariots to charge forward of their line. ... but also far advanced from his own line. 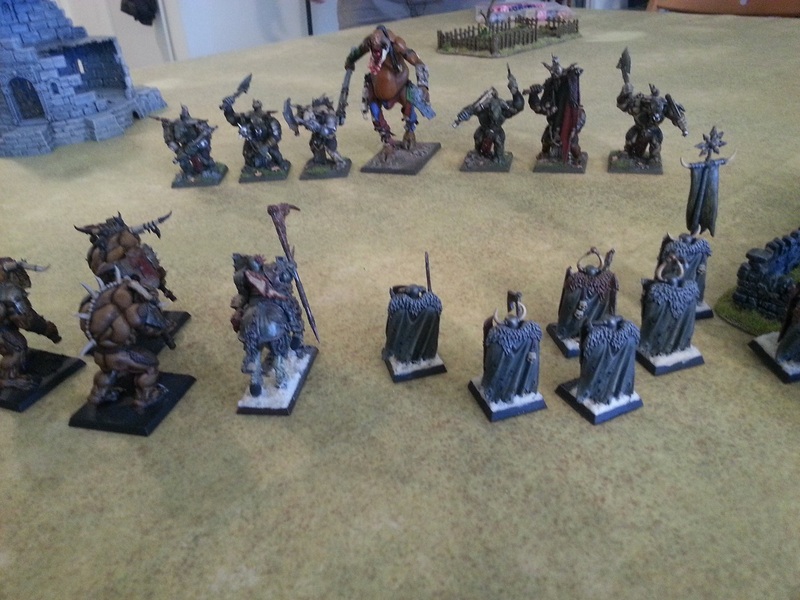 On the right I decide to just run past the rough terrain and enemy light troops and ignore these as best I can. 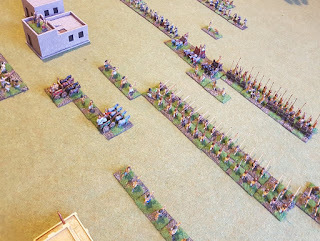 My pike charge into his pike and force them back despite him having the edge in these combats. The left flank of my phalanx is exposed though holding spectacularly despite this. On the left I surround his King's chariot and destroy it! Forward comes another Sumerian chariot and that is also dealt to. Much Equid death on the left flank as both of us lose Equid chariots. Over on the right my right flank attack has killed the archers guarding the right of the Sumerian phalanx though, and I start to win there. 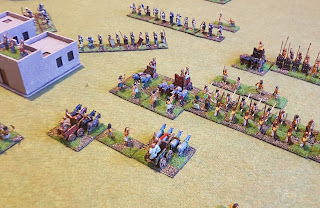 I lose a small command on my left flank with death of light troops and their Chariot general. But the Sumerian right flank is demoralised, and in the same turn we have lost enough from our centres (one more element each) to break both our armies! 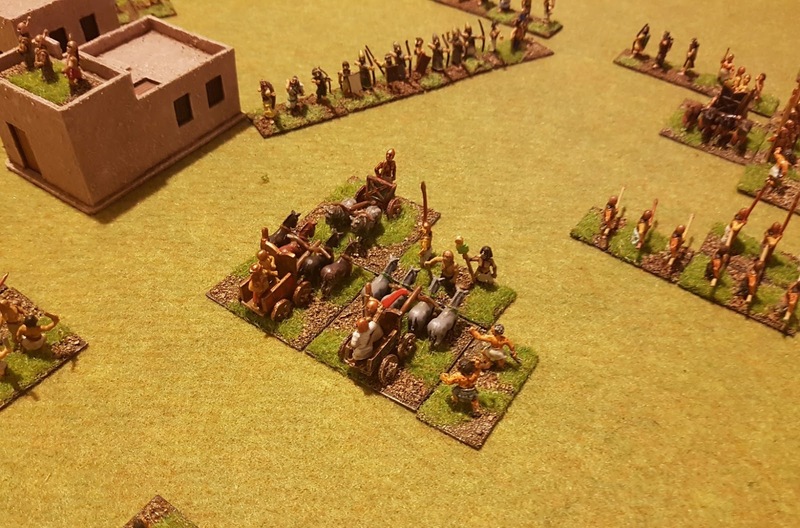 It seems this is a mutual destruction, with both armies spent and retiring in a draw! (Or at least that is how we interpreted it, we were a bit vague on the rules in the Big Battle version). An interesting game and first time a draw has occurred for me in DBA. It would be interesting to try the same battle using ADLG which is the French ruleset we use. The other thing I noticed about this was the strong similarity to later Hellenistic armies. 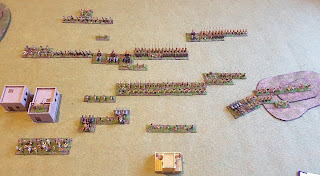 Here again we have armies with a phalanx, light troops, and heavy breakthrough cavalry arm. 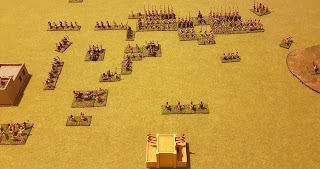 This meant the battle had a similar flavour, though greater numbers of light troops and archers were present in these Sumerian/Akkadian armies. Nice action with some truly ancient opponents! Great report with superb figures. I play DBA and am considering whether to buy ADLG so would love to read a comparison game if you do one! All the best! Cheers Noel, will add an ADLG battle report once Andrew available again. Can highly recommend ADLG. 4th reprinting of it is occurring at the moment I understand so should be available in next few weeks. Wonderful lines of battle, a great looking game!